It is leftists who want to chill the speech of those criticizing the protesters for disrespecting the American flag. Instead of invoking bogus free speech issues, shouldn't we talk about the content of the protesters' complaints and the propriety of their manner of expressing them? It seems the thrust of the protesters' complaint is that American law enforcement and America itself are systemically racist. If the complainants truly are asserting that America's law enforcement institutions or America itself are systemically racist against African-Americans, they bear the burden of proving their assertions, especially when facts and statistics appear to contradict those claims. The Washington Post reports that of the 963 people shot and killed by police in America last year, only 17 of the victims were unarmed African-Americans. On its face, that's a troubling number, but it does not suggest systemic racism of law enforcement. This is not a dispositive statistic, but it is one that must be considered among others. Lest you accuse me of exaggerating the protesters' position, note that I'm just listening to what many of them and their supporters say on national television and radio. Universities are replete with courses railing against white supremacy and racism in this country. The professional leftist protest cabal, Antifa, is certainly making these claims unambiguously, and mainstream Democrats and the media are championing their cause. Antifa is so extreme on white privilege that you can sometimes hear its members berating fellow white colleagues for joining protests because they are "inherently racist." No reasonable person can defend specific acts of racist behavior, especially by law enforcement officers. But protesters shouldn't get away with misstating facts to prove their claim. Such distortions cannot possibly help correct actual instances of racism. Protesters should be challenged, for example, if they claim racism is involved when a black officer shoots a black civilian. When protesters cite Michael Brown and Ferguson as an example of "hands up, don't shoot," they should be called out for misrepresenting the facts. Brown was not shot in the back by a police officer while peacefully trying to surrender, yet many have intentionally perpetuated that destructive myth. People are tired of police officers being attacked and accused of systemic racism. The overwhelming majority of citizens would be appalled and outraged if they believed it was true. People are alarmed at being presumed racist based on the color of their skin. No one wants to be unjustly accused of racism -- one of the most damning charges that could be leveled in our society. As the charge is so damaging, it shouldn't be made freely and indiscriminately or without a strong factual basis. Those who do systemically engage in such baseless accusations should themselves be condemned for it. 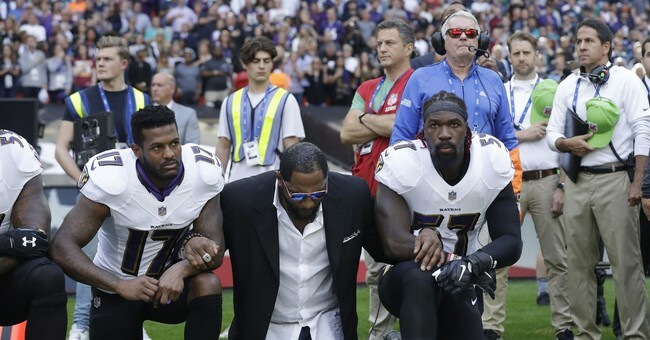 Protesters are free to kneel during the national anthem, assuming the NFL chooses not to discipline them for a rule violation, but fans are also free to express their disapproval of the protesters' overt disrespecting of the American flag. Many fans believe that regardless of the merits of the protesters' claims, it is inappropriate for them to express their complaint in this form -- because it implies, if not outright expresses, that the nation itself is somehow guilty of the type of racist behavior they are protesting. Many Americans are fed up with the ongoing effort in our culture to trash this nation and its historical symbols -- not just controversial Confederate symbols but many others, as well. Evidence of racial tension in America is not limited to football players kneeling. There has been an ongoing effort by race agitators on the left to stir the pot for political and other reasons. A conservative can hardly take a political position on any issue, no matter how innocuous, without someone on the left's accusing him of racism. Talk about chilling speech and political dissent! President Trump provides a convenient scapegoat for the left and many on the right. Criticize him if you must for fanning the flames, but don't fool yourself that he is responsible for the overall problem we face, which is serious and must be taken seriously. And be aware that many appreciate it when people in leadership positions defend the sanctity of the flag.